Mastery? Good idea. But what to master? 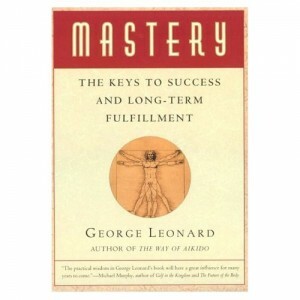 Mastery by George Leonard is a good book. I recommend it to anyone, since it harmonizes well with the theme of this blog. It describes the best path to mastering just about anything, I suppose. We only have so much time on this world, a fact made tangible in our middle years. What is the best way to spend our time? To spend our lives? No small question. Shall we build on existing skills or start something new? What if we enjoy something, but we think we’re more likely to master something we’re already rather good at but don’t enjoy? When has something run its course? What about those around us, who need our involvement and attention? Naturally, our responsibilities come first. But after that, what are worthy pursuits? What makes them worthy? Perhaps volunteering. Yes. After personal responsibilities comes volunteering. After that, if we’re lucky enough to have free time, what then? I suggest this for your consideration: activities that nourish mind, body and spirit. Not for their own sake, but to enrich our contribution to the outside world. To make us feel more comfortable in giving, whether it’s a donation, our time or a smile. That sounds rather worthy, no? You thought you knew how to stand? Hah! My blog-brother taichiplayer has alerted me to an article in the March 2009 issue of Tai Chi magazine. It gives instructions on standing for Yiquan practice. It’s pretty straightforward, but it posits the idea that many teachers are too easy on their students, teaching them postures that aren’t challenging enough to develop power and improve health. The next time you’re at larger magazine racks, check it out. Another site for Yiquan fans is J.P. Lau’s site, which contains a lot of good stuff. I particularly like the 305-page Yiquan Beginner’s Guide, which contains a number of concepts we’ve discussed in class, which naturally, provides the kind of connection I like: remote info matches local info. This book was recommended by Xue Sheng on MartialTalk. Of course, material like this doesn’t substitute for hands-on experience with a live teacher. But you knew that.